THE Canal & River Trust has increased the opening hours for boats passing the landslip on the Staffs & Worcs Canal at 9am today. 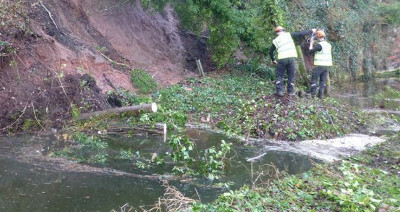 It was in early March that the landslip occurred just above Wolverley Lock causing a complete blockage of the waterway, but eventually a narrow passage for boats was created but under strict control by staff, Keith Gudgin tells us. Though there was concern about the stability of the ground, it has remained secure, and so the restricted opening hours are to be extended from 9am to 3pm each day. Boats will also be allowed to pass through unsupervised, but staff will be checking the cutting to ensure it remains stable and therefore safe to navigate, with boaters asked to go through slowly.